Life's pretty hectic these days and I barely have any free time between university, interning and working part-time. These shots were taken last week when wandering around Brick Lane and the Shoreditch area of London between a lecture and heading to work! 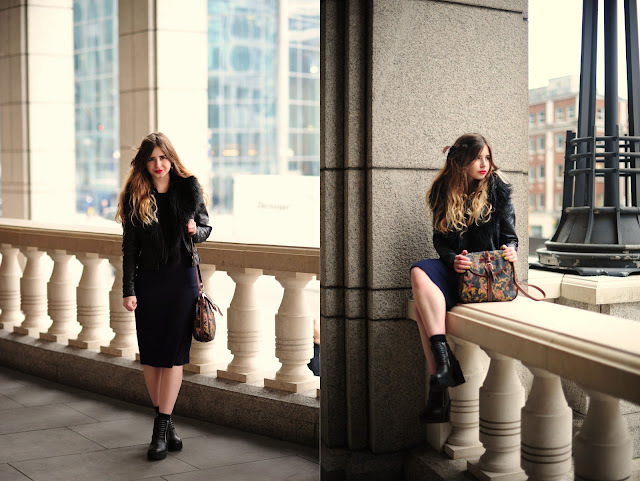 I don't really know what I was thinking pairing my midi dress with bare legs in Janurary - I was freeeeezing cold! This midi is something I picked up from Primark in late December for only £10. I've been wearing it quite a lot over the course of January as I love experimenting with new lengths and I really like the deep blue shade. I can't rave about my new H&M boots enough - I literally have worn them everyday since I bought them. I'm a sucker for a chunky heel and these offer a dressed up, yet grungy element to any outfit. Sorry to keep it so short and sweet. Make sure to follow me on Twitter (@helloomonica) and Instagram (@monicabarleycorn)! Love the Midi dress, can't believe it was only £10! I've seen those boots floating around on Instagram, love them! Really love the photography on your blog always gorgeous! I felt cold thinking about bare legs in january in the cold weather we've been having! but it does look lovely, great outfit!! Wow love the setting of these photos! Such a cute outfit, love these pictures! Your blog is amazing my dear! You are quite stunning as well ;).